The Greater Boston Program wrapped up yesterday with the Consequences module with the help of a number of our dedicated volunteers. 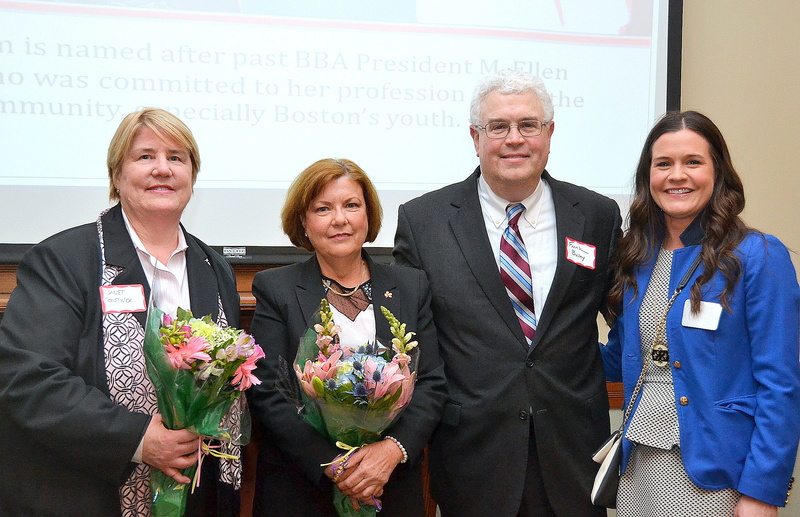 In its 10th year, the M. Ellen Carpenter Financial Literacy Program taught students from 15 Greater Boston schools about the importance of making informed financial decisions. However, none of this would be possible without the help of our wonderful volunteers. Thanks in large part to our dedicated volunteers; the Financial Literacy Program was able to reach more classrooms than ever before! Beyond the Billable would like to acknowledge the 142 attorneys, legal staff, and law students who volunteer their time to teach students how to make sound financial decisions. You may also remember this post about the Financial Literacy Program, which ran in Western Massachusetts this fall. Are you interested in getting involved? Please watch for opportunities to volunteer for the Financial Literacy Program this summer as part of the enrichment seminars for the BBA’s Summer Jobs students. Christopher Brine, Culik Law P.C. Christopher Condon, Murphy & King, P.C. Andrew Lizotte, Murphy & King, P.C. 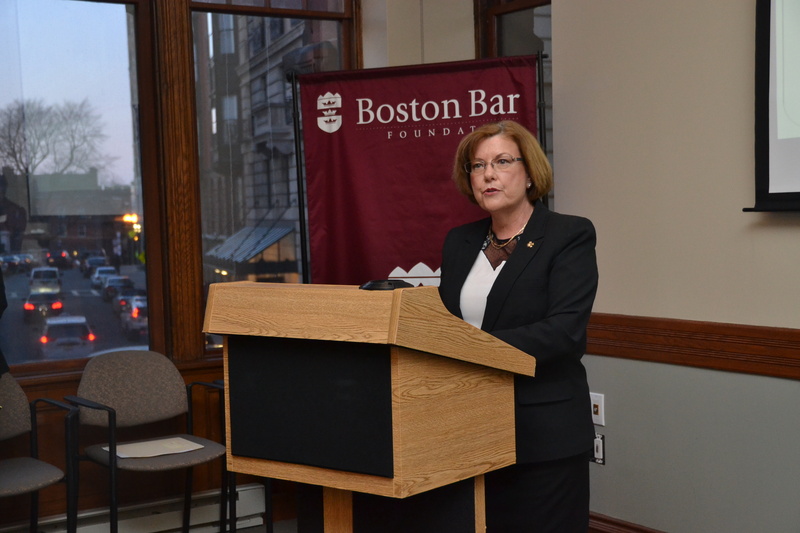 Judge Joan Feeney let students from New Mission High School past the bench and answered questions about how the Court’s computer system works during their trip to the Boston Bankruptcy Court. Last Friday, a group of students from New Mission High School in Hyde Park took a field trip to Boston Bankruptcy Court to meet “Sally Spender” and learn what happened to “Sally” when she failed to budget appropriately and accumulated high amounts of credit card debt. This lesson, Consequences, was fourth and final module of the M. Ellen Carpenter Financial Literacy Program. The experience wasn’t all about Sally’s mistakes, though. Students got a first-hand look inside a courtroom and had the opportunity to ask lawyers, Judges and court staff questions about what Bankruptcy Court is like. John G. Loughnane (Nutter McClennen & Fish LLP) moderated the session and led the students through a discussion of how Sally Spender could have avoided going bankrupt. 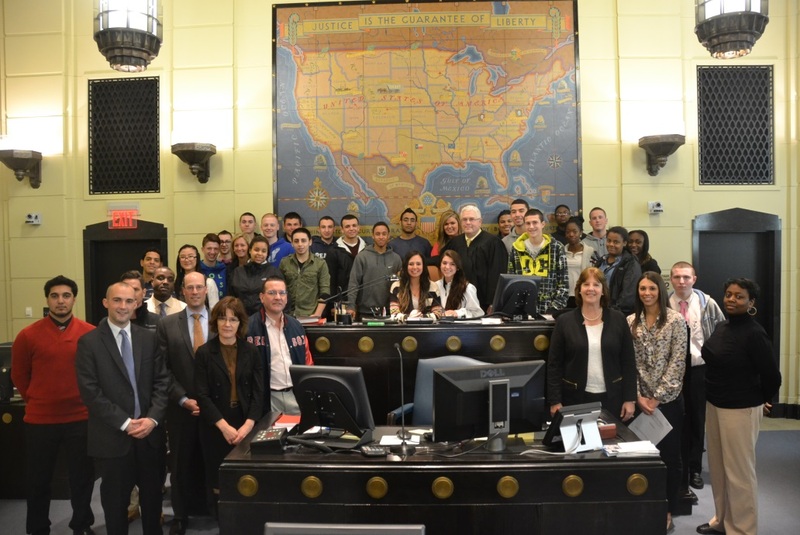 Seniors for New Mission High School in Hyde Park had the opportunity to visit the Boston Bankruptcy Court, listen to a mock meeting of creditors and hearing, and talk to the attorneys and the Judge after the session. Volunteer Attorneys Steve Cohen and Eric Teasdale from Choate Hall & Stewart LLP discuss the hidden costs of buying a car with students at Edward M. Kennedy Academy for Health Careers. Students listen attentively as the volunteer attorneys explain the difference between the cost of purchasing a new or used car. So what’s next? Students will head to the Worcester or Boston Bankruptcy Court at the end of the month for the final module in the Program called Consequences. Student’s from Another Course to College ask questions about how to build credit. On Friday, students in Jerry Howland’s law class at Another Course to College in Brighton had a crash course in credit cards. With the help of Attorneys Adam Ruttenberg (Looney & Grossman LLP) and Patricia Saint James (Looney & Grossman LLP), the students learned the basics of credit and how to build credit while making smart choices about their finances. This is the second session in the four-part M. Ellen Carpenter Financial Literacy Program (you may remember this post about the personal finance and budgeting session). Volunteer attorneys Patricia Saint James (Looney & Grossman LLP) and Adam Ruttenberg (Looney & Grossman LLP) taught the students about using credit wisely at Another Course to College. 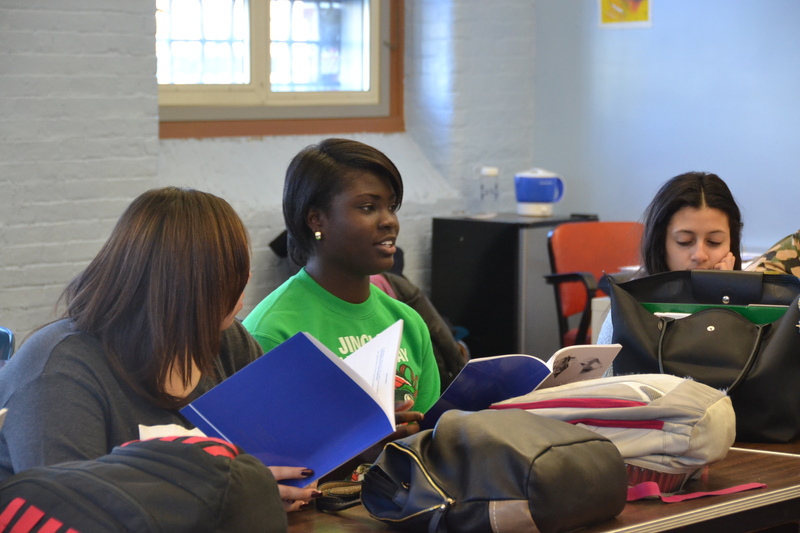 Students answer questions about the difference between debit cards and credit cards. 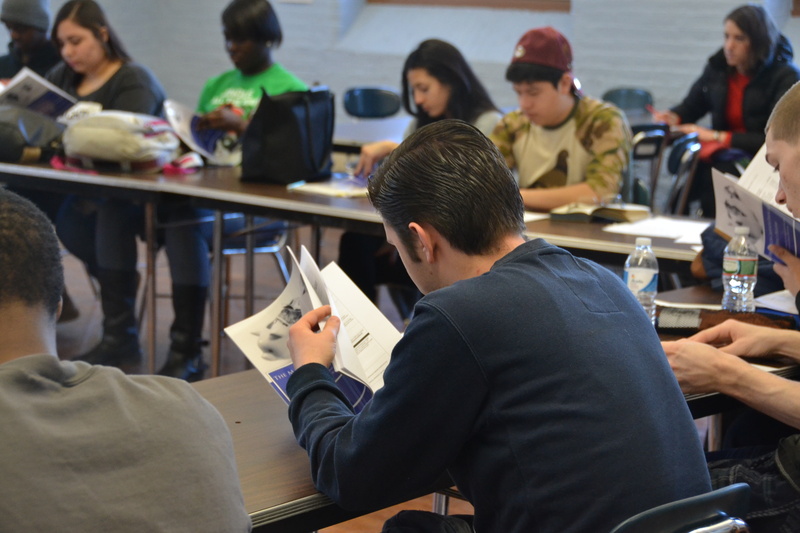 Students from Another Course to College review the Financial Literacy materials on credit cards. Next up for the students is the ever popular “Buying a Car” session, which will be followed by the “Consequences” session at the US Bankruptcy Court. Stay tuned for more! 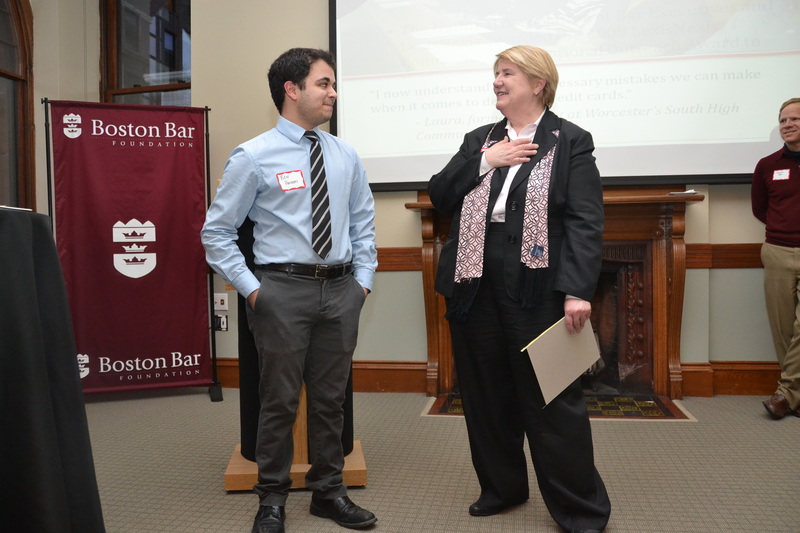 Ben Haideri, a senior at Boston Latin Academy and 2013 Summer Jobs Student, shared his experience in the M. Ellen Carpenter Financial Literacy Program last summer, answered Janet Bostwick’s questions about the Program at the 10th Anniversary Celebration. 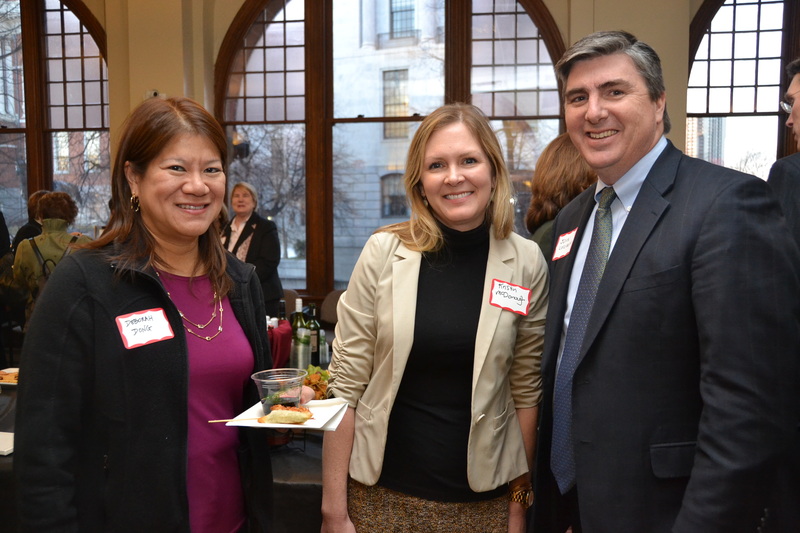 At last week’s 10th Anniversary Celebration of the M. Ellen Carpenter Financial Literacy Program, guests got to enjoy a unique experience, seeing the effects of the Program in front of their eyes. Ben Haideri, one of the 4,000 students who have participated in M. Ellen Carpenter Financial Literacy Program since the program began, agreed shared his experience in the Program with party attendees. 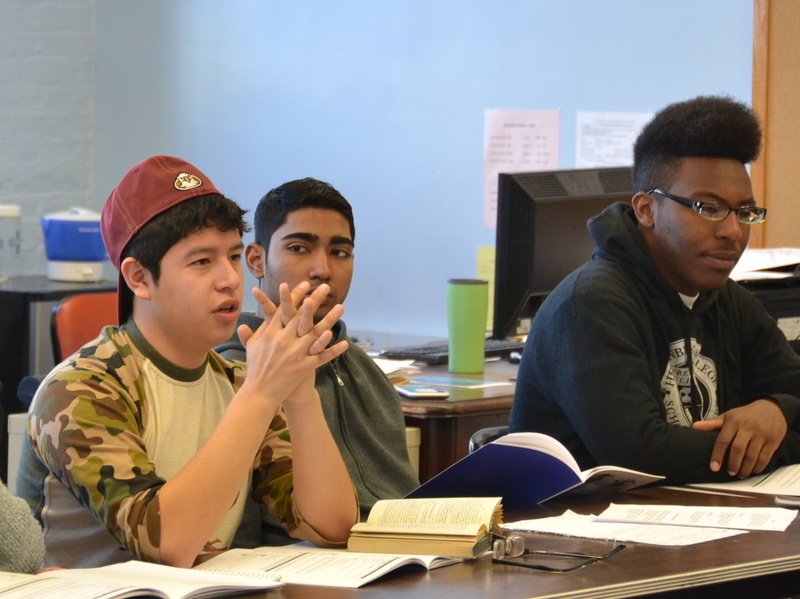 You may remember Ben (who is a senior at Boston Latin Academy and 2013 Summer Jobs student) from this article or this article—he’s a bit of a legend at the BBA. He took part in the Program during the 2013 Summer Jobs Program, when it was offered as a series of enrichment seminars. How have you applied what you learned from the program? What do you think was the most important thing you learned? Last night, program leaders, volunteers, and teachers gathered in the Claflin Center to celebrate the 10th anniversary of the M. Ellen Carpenter Financial Literacy Program. The evening focused on celebrating the success of the Program, which has reached more than 4,000 students statewide with the help of over 425 volunteers since 2005. Attendees also gained a firsthand account of the impact of the program from 2013 Summer Jobs Student Ben Haideri, who has put his financial literacy into practice, opening a savings, checking and credit account since experiencing the Program. Program Co-Chairs Janet Bostwick (Janet Boswtick, P.C. ), Judge Joan Feeney (U.S. Bankruptcy Court), and Mackenzie Shea (K&L Gates LLP) with Chief Judge Frank Bailey (U.S. Bankruptcy Court). Judge Joan Feeney spoke about the history of the program and highlighted everyone who has made the program possible over the past ten years. Ben Haideri, a senior at Boston Latin Academy and 2013 Summer Jobs Student, shared his experience in the M. Ellen Carpenter Financial Literacy Program last summer. 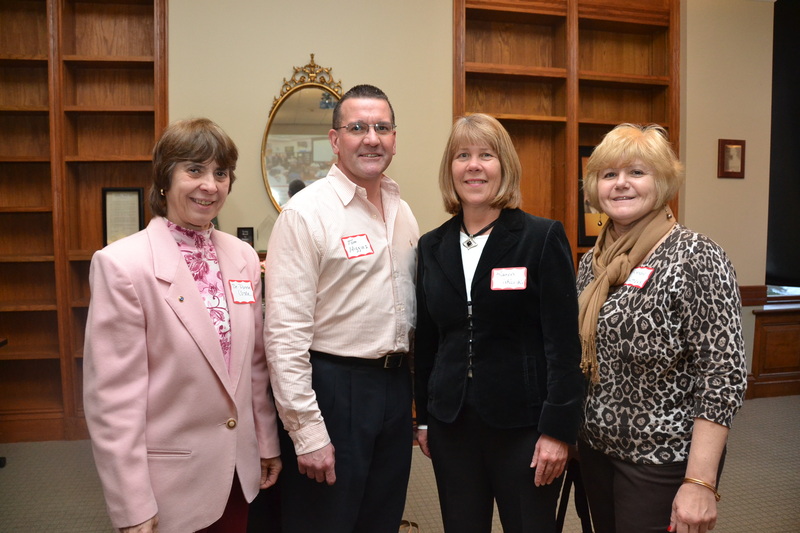 Dr. Donna Costa, Tom Higgins, Karen Sikorski, and Rosemary Slattery from Peabody High School attended the event. Tom Higgins’s law class has participated in the program since 2007. 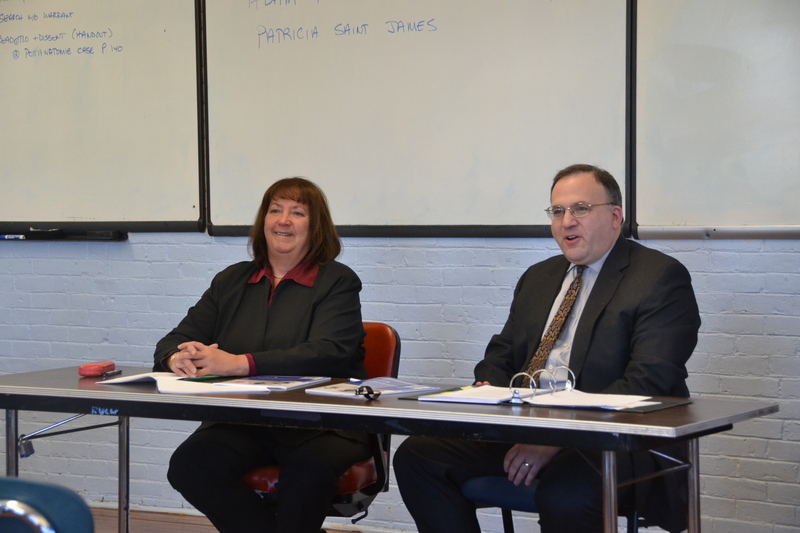 Hampden County Bar Association President-Elect Christina Turgeon (Law Office of Christina M. Turgeon) and Western Massachusetts Financial Literacy Co-Chairs John Davis (Cooley Shrair, P.C.) and Elizabeth Katz (The Law Office of Elizabeth Katz). 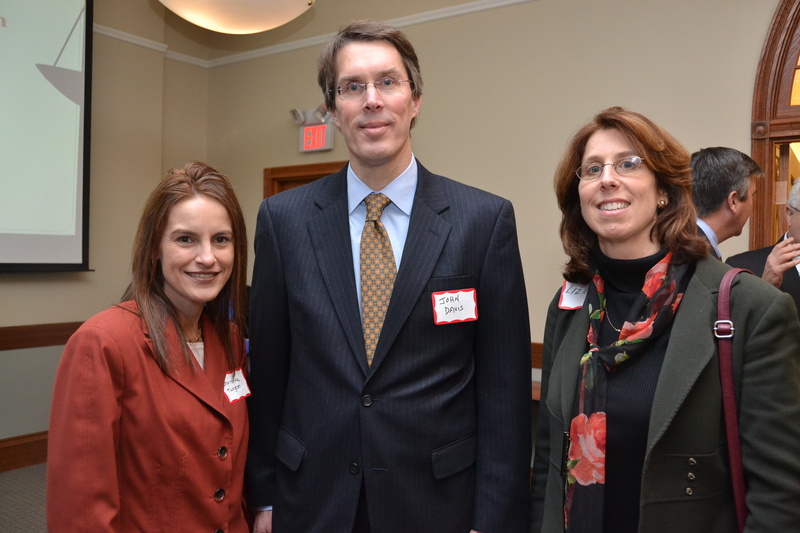 Volunteers Deborah Dong, Kristin McDonough (Riemer & Braunstein LLP), and John Loughnane (Nutter McClennen & Fish LLP). Stay tuned for more on the event. M. Ellen Carpenter Financial Literacy Volunteers enjoy the opportunity to give back to their community and address a real need among high school students. This winter is flying by and we are already halfway through the M. Ellen Carpenter Financial Literacy Program in the Greater Boston area. BBA Week thought it would be a great idea to reach out to the volunteers who have already participated in the program to see what they enjoyed most about their experience. The response was overwhelming, which is why we couldn’t help sharing it with our readers. If you haven’t volunteered yet, see what you are missing out on here. Are you interested in getting involved? It’s not too late to volunteer! Click here to view available sessions. Students from Holyoke High School traveled to the Springfield Bankruptcy Court to learn about the Consequences of making poor financial decisions. While the M. Ellen Carpenter Financial Literacy Program is only halfway done in the Greater Boston area, volunteers spent the fall and early winter delivery the program to students in Western Massachusetts. Each year the Hampden County Bar Association and Hampshire County Bar Association team up with the BBA and U.S. Bankruptcy Court to teach 100 students at Holyoke High School, Northampton High School, and Easthampton High School about the importance of making informed financial decisions. Jennifer Butler, Weiner & Lange, P.C. Alex Hogan, Shatz, Schwartz and Fentin, P.C. Joseph Lange, Weiner & Lange, P.C. Andrea O’Connor, Weiner & Lange, P.C.